This week, my girlfriend Lisa was on spring break from grad school, so on Sunday we packed up tent, food, and cameras and drove out the Columbia River Gorge to spend a couple days exploring, hiking, and pretty much just seeing what there was to see. Leaving Seattle, we didn’t have any particular agenda, except that we wanted to drive through the Yakima River Canyon on the way down, and we wanted to visit the Goldendale Observatory on the first night. When we reached the canyon, we found a little place called the Umtanum Recreation Area, where we pulled over for lunch. From the parking lot, there was a bridge over the Yakima River which led to a hiking trail, so after lunch we hiked across the bridge, over some railroad tracks, and into the canyon. There wasn’t much sign of Spring yet, sadly, except for a few flowers, a bumblebee, and some trees that were just beginning to bud. As we made our way back along the trail, we wondered if the railroad tracks were active, given that they were so easy to access– a few minutes, a freight train rumbled down the line where I’d be standing a few minutes prior. It was an impressive sight, and trains would be a recurring part of our journey: the Columbia River Gorge is an incredibly active freight corridor, with BSNF trains rumbling past several times an hour. On our second night, camped at Beacon Rock State Park, the train tracks were maybe fifty feet away up a cliffside, and the rumbles and whistles of freight trains were a constant companion through the night. We had planned on staying at Brooks Memorial State Park on the first night, based on some recommendations in Lisa’s guidebook, but upon arrival there we found that the whole park was still closed for winter. It was a bit of a letdown, given that it was 55 degrees and sunny (and also it wasn’t even actually winter any more). But it would be another recurring theme of our journeys– parks and scenic areas closed, mostly due to budget cuts that meant the parks could only afford to stay open during peak season. So we pushed on, and found a campsite several miles down the road at Maryhill State Park. It was a nice place– our campsite was right on the Columbia River, and we spent a fair amount of time getting pictures of the river and the gorge. There was a truck stop right across the river, which spoiled the scenery a bit– although it did make for some nice night pictures. And in the morning, we were both grateful it was there, as we availed ourselves of the opportunity for a hot breakfast after spending a restless night on the hard, cold, almost gravelly ground of our tentsite. On the second day, we made our way down the gorge, stopping for a little hike along the Deschutes River, then lunching at a roadside overlook near The Dalles, Washington after our first two choices (both nearby parks) were, once again, closed for the season. In the afternoon, we drove out of the gorge toward Mt. Adams, exploring the area a bit and getting some great views of the mountain. At one point, in trying to get to the Big Lava Beds from Trout Lake, we found ourselves on a snowy forest road, and eventually had to turn back, leaving the lava beds for another time. We headed back down to the gorge and camped for the night at Beacon Rock State Park– this plan was almost thwarted when the main camping area there was also Closed For Winter, but luckily there was a year-round campsite right on the river that we were able to set up camp in. We had originally planned on climbing Beacon Rock in the morning, but after two clear and sunny days, we woke up to the sound of rain on the tent. So rather than take a mile-long trail up a slick rock into a windy, misty, sky, we headed down the road a bit to the Bonneville Dam. We got a personal tour from the guide, saw the fish ladder (including the underwater viewing area, which was pretty awesome, although it was only sparsely populated by fish– we’re already making plans to go back during the peak season). The rest of the day was mostly occupied by getting home, although we did stop briefly at the Mt. St. Helens Visitors Center to see what there was to see (answer: not much, given the weather). There was a neat little mile-long loop over boardwalks through the nearby wetlands, which we did before heading home. It was a fun trip, although after two nights of hard ground (Lisa didn’t have a sleeping pad, and I’d forgotten mine) interspersed by nearby nighttime trains, we were both ready for a decent night’s sleep. I’m looking forward to going back in the summer, when hopefully more places are open, and we get to see the gorge in full summer foliage. But we did get some pretty awesome Winter and Spring photos, if I do say so myself. Click Mt. Adams to check out the full set of pics on Flickr. Last June I spent a few days driving around the Olympic Peninsula. I made it up to Hurricane Ridge, to the Hoh Rainforest, and the beaches, and even though the weather wasn’t always great, I enjoyed it immensely. Later, relaying the details of the trip to my Dad on the phone, I mentioned that it would be a good place for us to go exploring and hiking for a few days. Dad and I have made plenty of similar trips before– in 2003, we went hiking in Wales, and in 2008, we spent a week together in Europe, taking the train from London to Berlin and stopping in Normandy for a few days to pay our respects at the D-Day sites. Not to mention all the trips we took when I was growing up. Anyway, our trip consisted of lots of driving, lots of hiking through the woods (and in snow, and over sand), lots of eating in greasy spoons, lots of talking and catching up, and (perhaps most surprisingly for the Olympic Peninsula) lots of sunlight. There were snow-capped mountaintops, clear views across the Strait of Juan de Fuca and deep into Canada, vibrant sunsets over the Pacific, and warm sunlit beaches bearing more resemblance to the South Pacific than Washington state– at least until you stuck your foot in the water. I’m sorry, did I say “a few?” I meant fourteen. It’s just that the number of environments and ecosystems we crossed was so huge– from the ocean (above and below the water), to the coastal forest, to the inland rainforest, to the snow-capped mountaintops and everything in between– that it’s difficult to capture the range of what we saw in just a few pictures. And we had perfect weather the whole way, which is pretty extraordinary, given that most of the Olympic Peninsula is absolutely inundated with rain (the Hoh rainforest gets 140 inches a year). And to get to spend four days catching up with Dad in the midst of all this cool wildlife and weather and scenery? Made it just about the best trip ever. There were a lot of events going on in Seattle last Saturday: the presentation of the Locus Awards (congrats, winners!). The Seattle Solstice Parade (which I took part in last year). My bi-weekly writing group. Throw in other interesting-sounding events like the Seattle Iranian-American festival and there was simply going to be no way to do everything I wanted to do. Sometimes, the only way to win is not to play. So instead of picking between various events in Seattle, I went on a road trip. I hadn’t been a good road trip since September of last year, and besides, I had a long weekend coming thanks to my night-to-day shift change at work. So on Thursday I packed up clothes, hiking gear, and camera, and caught the ferry, heading to Bainbridge Island and the Olympic Peninsula. 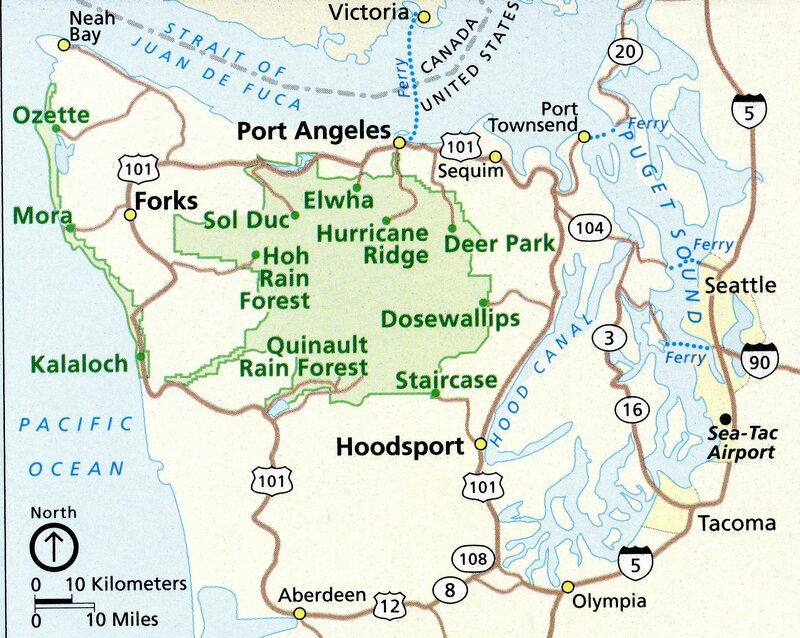 The Olympic Peninsula, for those of you unfamiliar with Washington state geography, is the huge chunk of land between Puget Sound and the Pacific Ocean. It’s surprisingly remote, despite its size and proximity to Seattle. The Olympic Mountains take up the vast majority of the interior, and pretty much prevent travel through the middle of the peninsula– except for forest service roads, all the roads circle the perimeter. When I set out, I didn’t have a specific plan in mind. There were a couple famous spots I wanted to see, but other than that, my plan was how my travel plans usually go: get there, explore, and see what there is to see. I spent the night at a little motel in the town of Port Angeles, and then on Friday headed into the mountains. Deep in the Olympics, almost twenty miles away from the highway turnoff along a winding, uphill road, lies the Hurricane Ridge Visitor Center, at 5,242 feet. It’s high enough that my ears popped plenty of times on the way up from sea level, but still well below the tallest mountains, which top out near 8,000 feet and are covered in snow 12 months a year. Even at the Visitor Center, there was still plenty of snow around the parking lot. Walking along a short path and cresting the ridge, you could look north, all the way across the Salish Sea to Victoria, Canada, and even further, to the San Juan Islands and the British Columbia coast range many miles beyond. Afterward, I headed all the back down out of the mountains and continued my loop around the perimeter of the peninsula. The whole area is rainy, especially the west side, which gets 140+ inches of rain a year. But even the dry side of the peninsula is still wet and lush, and all around the base and valleys of the mountains is dense, green rainforest. At the Sol Duc River, I stopped and hiked about a mile in to see Sol Duc Falls. Afterward, I headed back out of the rainforest and drove all the way out to Cape Flattery, which is the Northwestern tip of the continental United States. Once again, utterly spectacular, albeit in a totally different way. There’s a lot of Native American history on the peninsula as well, and several reservations, including the Makah Reservation, which consists of about forty square miles around Cape Flattery. The major town on the reservation is Neah Bay, and there’s a really good cultural museum there, although it was too late in the day to pay a visit. But I wish I had. There’s a tremendous amount of history on the peninsula, but unfortunately it’s easily lost in the current day poverty. Neah Bay was one of the most impoverished places I’ve ever seen, and the signs placed every hundred feet along the road saying things like “Meth equals Death” and “Drugs are not the Makah way” suggested that there are a lot of modern-day struggles that threaten to destroy a proud and ancient culture. It did, indeed, make me sad, although it also made me want to come back and learn more. I spent the night in a little motel along the north shore road, and on Saturday woke to a dreary, misty day. My plan had to do some beach hiking on the Pacific Coast, but the dramatic sea stacks that line the coast were barely visible in the mist, and the wind was fierce. Plus, the water was too high to see any of the area’s famous tidal pools (starfish and other such critters are apparently a common sight, when the tides are right). Alas, because of the weather, I didn’t stay long. Instead I drove through the town of Forks. The town’s biggest claim to fame these days it that it’s where the Twilight books/movies take place, and it’s exploited that to boost its tourism industry, although it’s really too isolated to take great advantage of it. It’s a five-hour drive from Seattle, and the fact that it’s gained fame through a book series doesn’t change the fact that it’s a rainy, dreary place. Stopping at Forks just long enough for lunch, I made my way further south to the Hoh Rainforest, which is probably the rainiest place in Washington state (that’s saying a lot) at almost 150 inches of rain a year. It’s in a valley on the western side of the mountains, where all the Pacific weather gets trapped, and the result is a lot of rain, and an incredibly dense forest. There’s not a square inch of ground that doesn’t have something growing on it, and the air is so rich with nutrients and moisture that certain mosses are able to subsist directly off the air. In the second picture below, there are Hemlock trees that have grown so dense that they’ve actually fused together. After about an hour hiking through the rainforest, I headed back out to the beach to see how things looked at low tide, but still didn’t have much luck. Not surprisingly, the coast was as rainy and windy as ever. I had been planning to stay on the peninsula one more night and head back, but it was early. Thanks to the poor conditions on the beach, I hadn’t stayed long, so I headed back to Seattle early. I definitely want to come back, though. There’s all sorts of cool day hikes and multi-day hikes out there, and I want to give the beaches another shot later in the summer. For those interested, here’s the full photo set from the trip. Now I’m back in Seattle, back at work (on the day shift now, yay! ), and shifting gears to focus on the Clarion West Write-a-thon. Life goes on, but pictures remain… and, I hope, hint at more adventures to come. On previous trips, I’ve blogged and documented almost every single day, but given the vagaries of connections in the Montana wilderness, not to mention the difficulties of carrying a laptop into the backcountry, that just wasn’t possible this trip. So now I sit here, in the aftermath of it all– endless fascinating stories that don’t really connect unless I want to write something novel-length; several hundred pictures; a few amusing and/or weird videos that do not really belong on the planet Earth. Heck, I’ll start with one of those. When people think of Yellowstone National Park, they think of bears, or crowds, or Old Faithful, or a volcano that will one day kill us all. But when you’re standing in or near the caldera, in one of the countless geyser basins that litter the area, the utter strangeness of the landscape makes it difficult to remember you’re still standing on our own planet. The stark muddy landscape, with orange and brown bacteria mats spreading as far as the eye can see, and bubbling hot springs that throw up a field of steam so dense it’s like you’re walking through sulfurous London fog… well, it’s not planet Earth. It’s the sort of place you’d expect to find Captain Kirk fighting a guy in a lizard suit, is all I’m saying. While we were at Yellowstone, we walked around Shoshone Lake, which is believed to be the largest lake in the lower 48 states not accessible by road. Only hand-powered watercraft (canoes and kayaks) are allowed on it, and when you reach the top of a hill on the lake’s edge, you can essentially look out and see miles and miles of scenery– water, forests, and marshland– that looks no different than it would have to a fur trader in the area three hundred years ago. Both Yellowstone and Glacier National Park are also famous for their wildlife. Before either park lets you camp in the backcountry, they subject you to a fifteen-minute video detailing how to avoid bears, and what to do in the event of a bear encounter (answer: not be an idiot). In fact, a large swath of Yellowstone was closed to hikers, thanks to a recent bear attack that resulted in a fatality. So we followed the advice in the video, but despite that (or perhaps because of it), we didn’t even see any bears at all. Darn it! We did see plenty of bison, and chipmunks (see right), and one eighteen-inch long critter that looked sort of like a red fox, except that red foxes don’t climb trees. There were plenty of elk, too, including a few lounging right in the middle of Mammoth Hot Springs Historic District, aka the biggest town in Yellowstone. If you’re interested, here’s the full set of photos from the trip. Despite having lived in the Pacific Northwest for almost ten months, surrounded by the oceans and Puget Sound, I haven’t gotten out of Seattle much. I’ve only been on one day hike, and one camping trip to the Olympic Peninsula. So since summer weather in this neck of the woods (by which I mean “sunny and higher than 70 degrees”) is fleeting, I decided to take advantage of it and actually see some of the outdoor scenery for which the Northwest is famous. And thus, with only about two days’ advance decision time, I threw my camping gear in the car and headed out on the 440-mile Cascade Loop Scenic Highway. The simple need to enjoy summer wasn’t my only reason for going: I’ve felt overconnected, lately, and with two major sci-fi conventions coming up, I wanted to escape and recharge my batteries before so much travel and social chaos. And even though I’m only a few thousand words away from the end of my novel, I felt like a break would be good for the creative batteries as well. For what was supposed to be a relaxing trip, it didn’t start out well. First, I made the mistake of rushing my departure in order to make it to a McDonald’s about ten minutes down the road before they stopped serving breakfast… hey, I have a weakness for their biscuits. I make no apologies. The problem was that in my haste, I forgot my wallet. So, I had to turn around and go back home– and of course, I didn’t get my biscuit. But luckily, it didn’t last long. The weather cleared, and soon even the snow-covered peaks were visible. I didn’t have a specific plan or itinerary; my plan was to drive, listen to music, and stop at whatever happened to look interesting along the way. My first stop ended up being at a place called Deception Falls State Park, where a half-mile loop trail followed a lovely creek past a series of picturesque, occasionally raging waterfalls, and through some absolutely beautiful pine forest. There are a lot of little towns around the Cascades, most of which depend on tourism. During the summer there’s whitewater rafting, and hiking, and backpacking, and during the winter of course, there’s skiing. A few of the towns have come up with “themes” that, I suppose, make them even more enticing to tourists. For example, there’s the town of Leavenworth, which has modelled itself on a Bavarian village. Even the signs for the McDonald’s and the gas station were done up in ornate wooden Bavarian style. In my opinion, it had all the authentic character and charm of Disneyworld– in other words, I was not a fan. But I know a lot of people like that sort of thing, and in fairness, I did have a huckleberry cheesecake ice cream cone there that was absolutely superb. Another example of such a town was Winthrop, Washington– all done up in authentic Old Pioneer style, and perfectly charming, with friendly people, but it still felt fake to me. The eastern half of the Cascades Loop is dominated by that sort of landscape; hardy scrub brush and dry grasses scattered across an almost desert-like environment. I suppose it pretty much is a desert, actually… it just seems odd. Who knew the wet-and-rainy Pacific Northwest had a desert in it? The eastern side of the Cascades is also where summer hides from Seattle. The temperature went from low seventies to upper eighties, and the air conditioning in my car got way more of a workout than it has any time since I left North Carolina. I camped overnight just outside of Winthrop. After the sun set, I sat at a picnic table, far from any power outlets, and as I watched bats flit overhead in the quickly-fading light of dusk, I took advantage of the campsite’s free wi-fi to check Twitter and Facebook. I considered doing some writing, but the bright screen amidst the darkness was starting to give me eye strain, and besides, I did feel marginally guilty for staying connected on a trip where I was ostensibly supposed to disconnect myself. So after a few minutes, I shut down the laptop and went to bed… but the novelty of wi-fi at a campsite was still worth it. The next day, I made my way back over the Cascades, and saw some of the most spectacular scenery of the drive. The highway passed a lot of trailheads, but I didn’t have time to hike them, since I wanted to be back in Seattle by late afternoon. That’s okay, though– this was really just a scouting run of the Cascade Loop; soon I’ll go back and fill in more of the details. But even sticking mostly to the road, there were still some impressive sights to be seen, like Diablo Lake. And no, the color of this picture isn’t wonky; that was the actual color of the water. Eventually, the highway came down out of the Cascades and back toward the coast, and I continued outward to the islands of Puget Sound. The highway wound its way down Fidalgo Island and Whidbey Island, and in between them was one of the coolest things on the drive: Deception Pass. (Despite the similarity of the name, no relation to Deception Falls State Park.) And on the day I visited, the clouds were having a field day, coming and going every few minutes and creating some pretty cool effects. After walking the length of the bridge twice, taking pictures and marveling at the view, it was time to finish the trip and head home. I traveled to the south end of Whidbey Island and caught a ferry across Puget Sound, back to the mainland, heading south just in time to get caught in Seattle rush-hour traffic. Ah, well, you win some, you lose some. But all in all, I’ll chalk that trip up as a win. The full Flickr set is here. And I’m already looking forward to seeing the Cascades again. Anyone up for a hike? Early in the afternoon of Day 11, I finally arrived in Seattle. It was a gray, overcast day, the kind for which Seattle is famous– although it wasn’t actually raining. The final two hundred miles was uneventful, except for the part where I lost the directions I had written down (there were a few zigs and zags across various rural highways), and was unable to get a signal on my cell phone to recover said directions. So for about an hour I had to guess my way down the road, but it turned out all right. I didn’t even make any wrong turns. The final stretch was through the pine forests of the Pacific Northwest, and up Highway 101 (the Pacific Coast Highway) for a large chunk of the time. It was beautiful, dense forest, dark green speckled with the occasional burst of autumn yellow. The forest here has a totally different feel than the forest on the east coast, and I’m already looking forward to hiking in it. The last hour of so of the drive passed through a string of cities: Olympia, Tacoma, and then Seattle, with downtown and Puget Sound finally materializing in the distance. I’m staying in an extended-stay hotel (basically a month-to-month apartment) near the Space Needle; hopefully after a month I’ll have a permanent place, and in the meantime I can get a much better feel for the city and its neighborhoods. So, I made it. It was one heck of a trip: eleven days, ten hotel rooms, countless cities, snow, rain, wind, and plenty of sun too. There was heat, cold, one and a half long audiobooks, plenty of caffeine, a herd of cows, a herd of bison, and a herd of… I’m not sure. It ranged from the top of the Sears Tower, to the Mississippi River, to the Yellowstone caldera. Still, I have little doubt that the hard part lies ahead. Getting to a new city? Even moving across the country, that part is pretty easy, compared to making that city your home. But I’m optimistic. I’m posting this after having spent a few days in Seattle, and I’m already loving it. I’ve been to four coffee shops in four days (and I don’t even drink that much coffee! ), and am slowly learning my way around the complicated-but-convienent bus and trolley system. I’ve been walking quite a bit, too. I love having so many things in walking distance (or a short bus ride) from where I live, and even the infamous Seattle rain has been little more than an occasional nuisance. 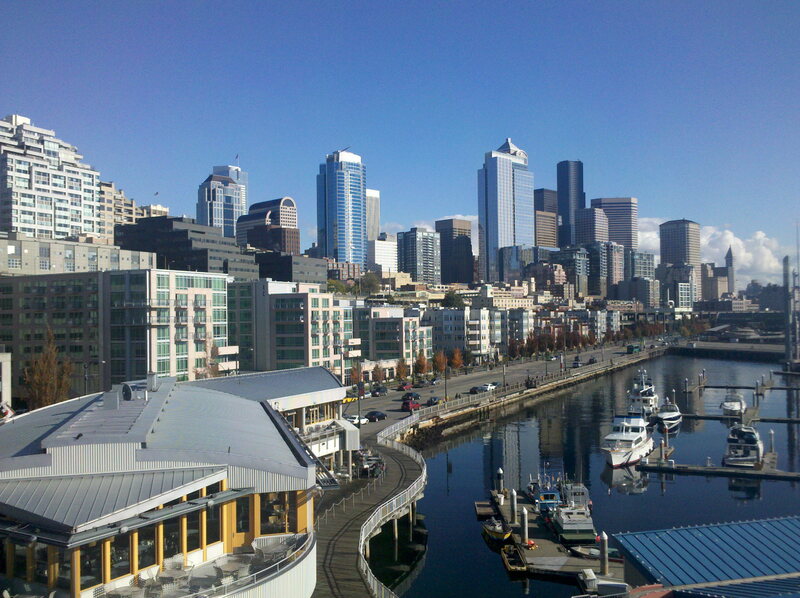 So in conclusion, here’s a picture of the Seattle waterfront that I took on Friday. From where I’m standing, I think I’m going to like it here– but I have a strong hunch that the real adventure is just beginning. In my last blog post before I embarked, I estimated my Seattle arrival date as October 27th. Turns out I was one day off: it’s now the 27th, but instead of being “home” in Seattle, I’m in a hotel room in Seaside, Oregon, about 200 miles south. This is mostly on purpose. I have a place to stay in Seattle, but I can’t move in until the 28th. Sure, I could have gotten to Seattle early and stayed in a hotel there, but instead, I took the opportunity to dawdle in the city of Portland. First I spent a couple hours in Powell’s City of Books, which is the largest used and new bookstore in the world. It takes up an entire city block, and I could have easily spent the whole day there, but my checking account would not have survived. After escaping Powell’s, I walked through Portland’s Chinatown to the Lan Su Chinese Garden. It’s designed to resemble as close as possible a real Chinese garden from the mid-1400’s, and if the guided tour is any indication, it’s doing a dang good job of it. It was designed and built with a huge amount of help from Portland’s sister city of Suzhou, China. Every plant and tree was carefully picked and placed, and everything from the floor tiles to the shingles on the roof is designed with a very specific purpose that adds to the overall meaning and symbolism of the garden. Classical Chinese poetry is also inscribed in places, and illustrated, both in actual drawings and in symbolism, throughout the garden. It’s a fascinating look into Chinese culture and Daoism that I couldn’t do justice to in a single blog entry, so I’m not going to try. But if you ever find yourself in Portland, definitely check it out. They also had quite a few bonsai plants there, as well as its Chinese predecessor, penjing. I had fun taking photographs of these and trying to play with the scale. As the day began to edge into late afternoon, I headed back to the car and drove to my next destination: The Pacific Ocean. Part of me had wanted to visit the Atlantic Ocean before I left North Carolina, so that I could say this trip was truly an Atlantic-to-Pacific trip, but I just didn’t have time. That’s okay. I think it’s been a pretty epic trip anyway.